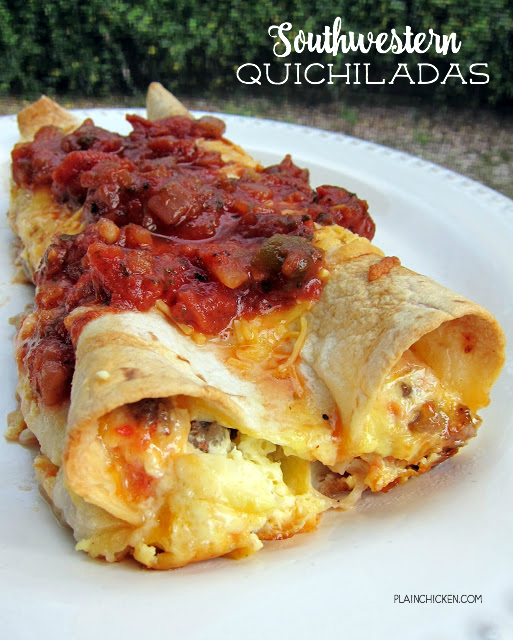 Southwestern Quichiladas Recipe - overnight breakfast enchiladas - tortillas stuffed with sausage, Rotel and cheese with an egg and half and half mixture poured over top - assemble the night before and pop in the oven for an easy breakfast! Top with salsa to kick it up a notch. Great for overnight guest or school morning breakfast. Quichiladas are one of our favorite dishes. We made another version of this dish last year (here) and loved it ! I changed it up a bit this time and took a Southwestern spin on the dish. I used sausage and Rotel tomatoes instead of the original ham and cheese. This was SO good. We both absolutely loved it! The dish is assembled the night before and baked the next morning or evening. I love these kinds of meals! We ate this for dinner, but this would a great dish to make for overnight guests. Assemble this casserole the night before and bake it in the morning. Spray a 9x13-inch pan with cooking spray. Set aside. Mix together sausage, Rotel tomatoes and 2 cups of cheddar cheese. Divide meat and cheese mixture between tortillas. Roll up each tortilla and place seam side down in baking dish. Whisk together half and half and eggs. Pour over tortillas. Cover and let sit overnight. When ready to bake, preheat oven to 350ºF. Bake covered for 30-40 minutes. Remove foil and sprinkle remaining 1/2 cup of cheese over enchiladas. Bake for 5-10 more minutes, until cheese is melted. Top with salsa if desired. Wow, what a great looking dish, this would be good at any time of the day. Mmmm...this is what I want to wake up to tomorrow morning. YUM! L-o-v-e- Love it. And Pinned. I've made the same breakfast casserole recipe for years and it will be fun to try a new one. This would be good for any meal of the day and I love that it is made ahead of time. Looks fantastic! Now I have one question, is that homemade salsa on top, or a store brand. It looks really good, too!!! lola - that is Trader Joe's roasted salsa on top. it is yummy! Looks delicious Steph and I also like make-the-night-before dishes. Thanks for the great recipe! We made it for Christmas morning and it was delicious!! S R Na'Na Norman - I would say this would feed 5 men. Soooooo exactly how do the eggs get into the tortillas??? According to the assembly directions sausage & rotel are rolled in the tortilla placed seam side down then the eggs, half and half are mixed and poured over the top to set overnight. Tana Banana, I would guess that from sitting overnight that the egg mixture seeps into the inside of the tortillas. Looks yummy! I "southern-ized" this. I used turkey sausage, added a little heat with tabasco, made a cup of white gravy, tossed that and half a bag of defrosted southern cut potatoes with peppers and onion. Stuffed the tortillas with the gravy/sausage/potato mix, then covered in cheddar. Added sour cream, tabasco, and onion flakes to the eggs, then poured the egg mix over the top. Set overnight and bake as directed. Southern delight! Holy mackerel. This is why sausage was created. Amen. So, so good. Topped with sour cream and salsa. Breakfast heaven. Except I served it for dinner. Brinner!